It may still be chilly, but the first warmth of spring comes to Kyoto in February, and with it, the first plum blossoms too. There’s also the fascinating Setsubun festival, which is celebrated at shrines around the city. It’s not normally possible to enter the beautiful pagoda at To-ji Temple, but during this special opening, you can enter the first (ground) floor of the pagoda to examine some of the fine Buddhist images contained therein. Setsubun marks the beginning of spring according to the old lunar calendar in Japan. Because it marks a new beginning, it’s the time to caste off old bad things and invite in good new things. At homes, people throw roasted soybeans out the door of their houses while shouting “Oni wa soto! Fuku wa uchi!” (Devils out! Good luck in!). People also commonly eat one roasted soybean for each year of their life, plus another for good luck in the coming year. 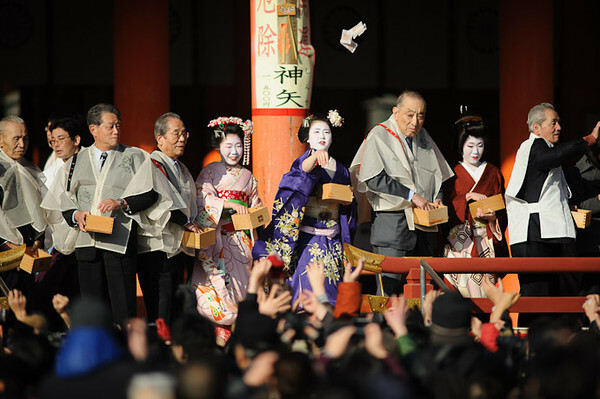 Some temples and shrines also hold Setsubun celebrations and the one held at Kyoto’s Yasaka-jijna Shrine is a great one, because the soybeans are thrown by geisha from the nearby Gion geisha district (Yasaka-jinja is considered the “patron shrine” of Gion). Beans are thrown from the main stage at 1, 2, 3 and 4pm on February 2nd and 3rd. If you’re in town, it’s highly recommended and good fun (and maybe also good luck!). Note that if you can’t make this festival or the following one, there’s another good one held at Heian-jingu Shrine (ask at your lodgings for details). Another interesting Setsubun festival is held at Yoshida-jinja Shrine, on the west slope of Yoshida-yama, above Kyoto University. 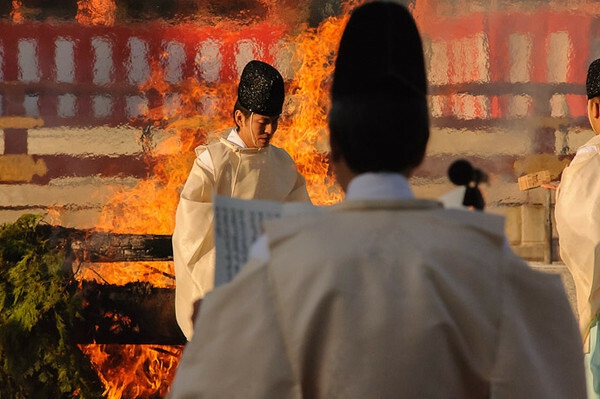 Unfortunately, the huge fire festival which made this festival so special in the past will not be held this year (and it’s unlikely to be held in the future). Instead, people gather to throw beans at performers dressed as one (devils). Thus, it’s not as interesting as it used to be, but it’s still a cool place to observe Setsubun. There are also plenty of stalls selling food and drinks. This event, somewhat similar to the one held at Yasaka-jinja (see above), is another good place to celebrate Setsubun. It’s also a good way to check out the lovely garden at this fine Arashiyama temple. If you can’t be in town for Kyoto’s two famous flea markets (Kobo-san Market and Tenjin-san Market), this is a good choice. Like the Kobo-san Market, it’s held on the grounds of To-ji Temple. You’ll usually find a good selection of antiques at this market. In mid- to late February, the plum blossoms start to bloom in Kyoto, which marks the real beginning of spring in Kyoto (preceding the cherry blossoms by a few weeks). Kyotoites, who are intensely conscious of the seasons, welcome the arrival of the plum blossoms with something approaching religious fervor (and you’ll see plum motifs of sweets in all the shops). 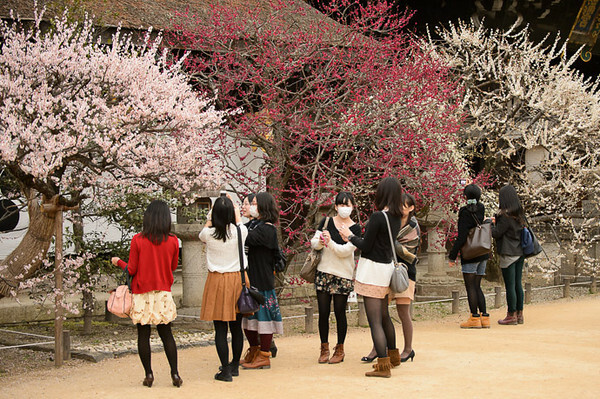 Starting in early February, Kitano Tenman-gu Shrine opens its famous plum garden and crowds descend on it to gaze in wonder at the pink and white blossoms and enjoy their bubble-gum-like fragrance. It’s a nice way to mark the coming of spring in Kyoto and the adjoining shrine is always lovely. Held at beautiful Sanzen-in Temple, in the village of Ohara (about 30 minutes north of Kyoto by bus), this festival is held to pray for a happy and healthy New Year and to help people endure the long winter. Daikon (long Japanese radishes) are prepared and served to temple goers and special Buddhist ceremonies are performed in the temple halls. Chion-ji Temple hosts a fabulous handicraft market on the 15th of every month. It’s a great place to pick up unique, locally made souvenirs during your travels to Kyoto. It’s also a good chance to see Japan’s alternative community and local expats. Named for Japan’s most revered Buddhist Saint, Kobo Daishi, this market is one of the two best markets in town (the other being the Tenjin-san Market, held on the 25th). You’ll find all manner of goods on sale here including used kimono, antiques, ceramics, food, bric-a-brac, old postcards and books, and assorted Japanalia. In addition to being a great market, this is also a chance to see Kyoto’s foreign community, which turns out in full, along with hoards of locals. Held at Daigo-ji Temple, in an eastern suburb of Kyoto accessible by the Tozai subway line, this is the largest festival of the year at this lovely temple. It’s performed to pray for peace, happiness and health. It’s most famous for an event in which people try to lift enormous mocha (rice) cakes, but there are other colorful and interesting ceremonies to check out as well. This festival, which is held to herald the opening of the plum blossoms at Kitanao-tenman-gu Shrine, coincides with birth of Sugawara Michizane, the scholar-poet-bureaucrat to whom the shrine is dedicated. There will be geisha serving tea and crowds of Kyotoites celebrating the beginning of spring. Like the Kobo-san market (see previous), this is one of the two best markets in town. It’s named for Sugawara no Michizane, a 9th century poet and scholar who is the patron saint of academic pursuits in Japan. Known colloquially as Tenjin-san, the market is a great excuse to visit this shrine and see people, especially school children, rubbing the two stone bulls in front of the main hall of the shrine (doing so is said to make one more intelligent). Like the Kobo-san market, this is a great chance to buy used kimono, ceramics, antiques and bric-a-brac, along with food and drink. You’ll also rub shoulders with an interesting assortment of expats and locals.